I have tried lots of high end skin care and more budget friendly buys in the hope of finding my favourite skin care products and the Body Shop Camomile Cleansing Oil and Vitamin E moisture Serum certainly tick all of the boxes in terms of quality and being purse friendly!! The Body Shop Camomile Cleansing Oil is a silky liquid oil which you massage onto dry skin to remove makeup and cleanse your skin removing it either by rinsing your face with warm water whereby it turns into a slightly milky emulsion or by using a wet flannel or muslin cloth (the latter being my personal favourite) leaving your skin feeling beautifully clean, nourished and moisturised. Honestly, this cleanser feels so luxurious! You don't need to be shy to rub this between your lashes and all over your face as it is really gentle and calming yet removes even the most troublesome of waterproof mascara extremely easily. It has quickly become my favourite cleanser to the point where I am afraid of running out so I have bought two extra bottles as back ups just in case!! I have really enjoyed pairing this cleanser alongside The Body Shop Vitamin E Moisture Serum. As I tend to have normal/dehydrated and sensitive skin, sometimes moisturisers can be a little heavy on my skin and so for the last month or so I have just been using this serum. It is a lovely light formula but certainly packs a moisture kick and yet leaves no residue on the skin. It just sinks in wonderfully. Since using these two products together, I have very few breakouts and my skin has been left so smooth and glowing. My skin has never been happier!! I highly recommend both The Body Shop Camomile Cleansing oil & Vitamin E Serum and believe that together they are a winning combination suitable for all skin types. 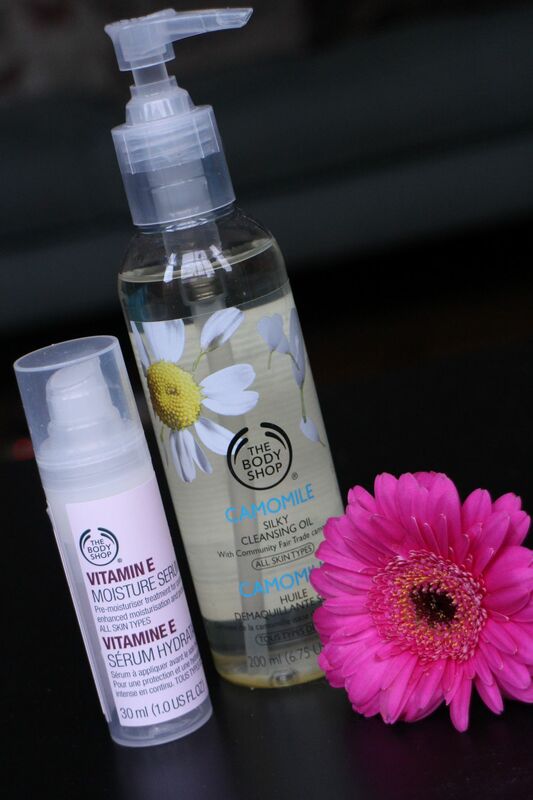 Have you tried any of the camomile or vitamin E range from the Body Shop? What do you think?